Rose oil is one of the most famous of all the essential oils. And it’s not just for it’s beautiful and distinctive scent. 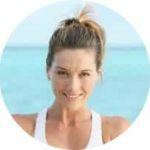 For thousands of years, it’s been used for its powerful health and beauty benefits. But, not all rose oil is the same. Because of the difference in how they’re made, they come in different types and at a range of prices. And the truth is, some are better than others for skincare. We’ve looked at over 20 different products to find the best rose oil for face care. In our buying guide, we’ll show you the important criteria to help you make a selection. And our reviews will show you our top-rated choices. You can find the reviews beneath the buying guide. Some readers have contacted me in a bit of confusion over what rose oil is. So, before we move onto the buying guide, I thought I’d clear things up. Rose oil and rosehip oil are not the same. They are two very different types of oil. Rose oil is extracted from the petals of the plant Rosa Damascena. It’s an essential oil. Rosehip oil is cold-pressed from the seeds of rosehips. It’s produced from a number of different types of wild rose bush. Mostly Rosa moschata and Rosa rubiginosa from the Andes. It’s a ‘fixed’ or carrier oil. 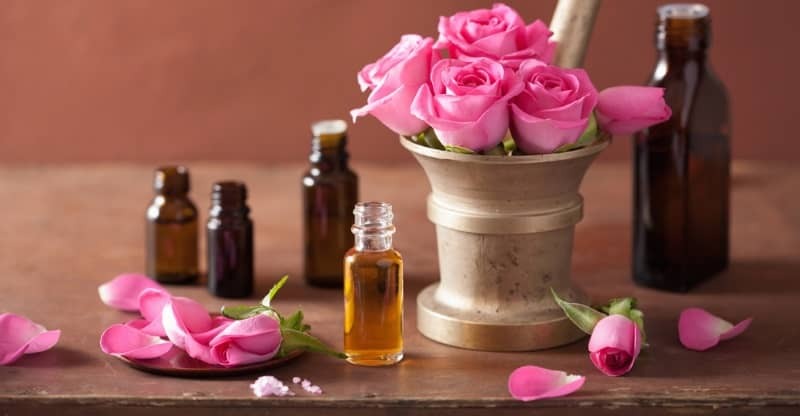 This is our buying guide for rose oil, which lists the most important things we considered when choosing our recommended brands. Rose essential oil comes in two different types that differ depending on the method of extraction. Rose otto is extracted by steam distillation. Whereas the production of rose absolute is by solvent extraction. The absolute is very concentrated. And of the two types, it’s the one with a fragrance that you would most expect from smelling roses. It’s also the cheaper of the two. Both have a use for skin care and provide all the benefits that you’re looking for. But, some people prefer to use rose otto because it’s obtained by a more natural process without the use of any chemical solvents. The choice is yours. The highest rated producers in the world are Bulgaria. This is something to consider if you’re looking for top quality. You should look to buy a 100% pure product. You see, oil that isn’t pure is often a blend with other oils. So if you’re looking to get the full benefits then you want to make sure you’re getting the real deal. The exception with rose otto is if you’re looking to buy it diluted because of its high price when pure. It’s best to get a product that’s organic. This ensures that there aren’t any unwanted pesticide or chemical residues in the product. USDA certified organic rose otto oil is available to buy. It’s not possible to get a USDA certified organic rose absolute because the solvents used in its production are not organic. Because it takes around 250 pounds of blossoms to make 1 oz of distilled extract, pure rose oil is expensive. If you see a product claiming to be rose otto at a price that’s too good to be true then there’s a good chance that it’s mixed with something else. Despite its high price, a little goes a long way when it’s genuine because it’s highly concentrated. So even though it’s expensive, it’s cost-effective in the long run to get the real thing. It’s a good idea to make sure it’s contained in an amber glass bottle. Sellers of quality oils will always use these, because plastic bottles degrade when used to store essential oils. The dark amber glass also protects them from sunlight. It’s best to avoid essential oils that come in a bottle with a rubber dropper in the cap. Because the rubber can dissolve over time. This is a rose otto from Alteya Organics. It comes in a dark amber glass bottle in 3 different amounts, 2.3ml, 4.3ml, and 10ml. Alteya Organics location is in the heart of the Bulgarian Rose Valley, where they grow roses and distill their high-quality essential oil. It’s 100% pure and natural and is USDA certified organic. This is strong and fragrant and leaves skin glowing. With people reporting how soft and smooth it feels to the touch after use. This is a rose otto from Miracle Botanicals. It comes in a dark amber glass bottle with a screw cap and is available in the following quantities: 2ml, 5ml, and 10ml. It’s 100% pure and natural and comes from Bulgaria from the famous Kazanlak Valley of Roses. Here, the blossoms are hand picked before steam distillation by the distiller. As they have been for the last 300 years. It’s an excellent quality oil that has a smell that most people find pleasant and long lasting after using just a very small amount. It has strong healing qualities and helps to moisturize dry skin, leaving it looking hydrated and improving texture and tone. It’s suitable for all skin types. Including combination, oily, and sensitive skin. And improves the appearance of mature skin. People also report success from using it to treat acne and in diminishing scarring. This product comes in a 5ml dark amber bottle with a screw cap. Because it’s an absolute it doesn’t claim to be organic, but it is a 100% pure oil. Many people prefer the scent of absolutes. And this product gets a lot of praise from people for its strong and long-lasting fragrance. But, at the same time, it isn’t overpowering when used sparingly. Nice, and not overpowering scent that smells just like roses. This product is diluted in sunflower seed oil for a 10% solution. It comes in a 5 ml dark amber bottle with a screw lid. It’s USDA certified organic and comes from Bulgaria. It’s usually diluted with a carrier for before use. So some people might find this product convenient. The fragrance is enjoyable, with many people appreciating its scent. Anti-aging – It has a very high level of antioxidants (1) that protect the skin and reduce the appearance of lines and wrinkles as you age. Moisturizing – It helps to keep the skin well hydrated and full of moisture by strengthening the skin barrier (2). Acne – It has powerful antibacterial properties that can kill the acne-causing bacteria (3). Anti-inflammatory – It soothes inflammation and eases skin conditions such as dermatitis, eczema, and psoriasis. Increased absorption – It can increase the absorption of other active ingredients across the skin barrier. Making it a good addition to homemade skincare preparations. This essential oil combines a distinctive and pleasing scent with a range of beneficial properties when applied regularly. It can protect from aging and it can moisturize. Its soothing properties also help to heal skin conditions like acne, psoriasis, and dermatitis. It’s a perfect ingredient to add to face oils, moisturizers, and homemade skincare preparations. As it increases the absorption of other active ingredients across the skin barrier. In our opinion, the product from the Alteya distillery is a premium choice and the best rose oil for skin care.